Passion fruit is one of my favorite flavors. I love it in pots de creme, in pâte de fruit, and in popsicles. But one of my favorite ways to enjoy its bright, sweet-tart, tropical flavor is in a classic passion fruit tart. If you’re a fan of lemon desserts, odds are you’ll be into this. 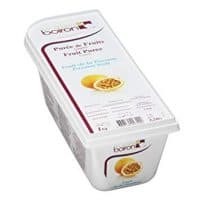 I tend to think of the passion fruit curd here tasting like lemon curd, but somehow fuller and rounder and–no disrespect to lemon curd–better. I sometimes think people hear passion fruit and think it’s some sort of impossibly fancy, pastry-cheffy ingredient, but there’s no reason to be intimidated. 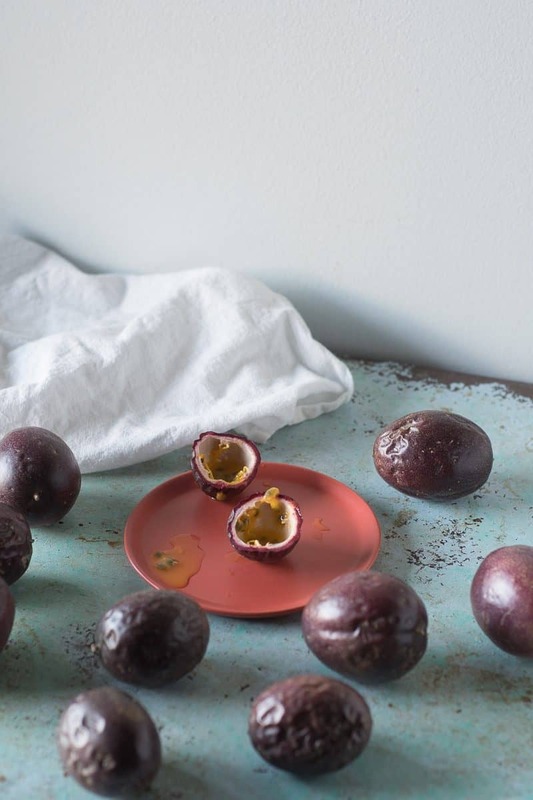 You can futz around with fresh passion fruit if you come across the wrinkly purple fruit (scoop out the juicy pulp and strain out the seeds). But I tend to have an easier time finding frozen passion fruit puree. It’s generally available in the frozen fruit section at Mexican grocery stores (and is available online if your local stores don’t have it) and is high quality and easy to use. Be sure to use something where passion fruit is the only ingredient and avoid shelf stable passion fruit nectars or juice with added sugar. The crust on this one is crisp and tender and delicate. 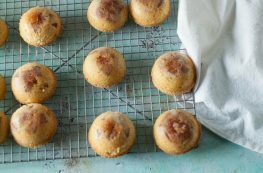 The powdered sugar gives it a lovely melt-in-your-mouth texture that I just love. But if you have a sweet tart crust (also known as pâte sucrée) recipe you like feel free to use it here. I like to top this with a swirl of whipped cream. It isn’t strictly necessary, but it is nice. Give this passion fruit tart a try, and after you take a bite, just try not to smile. I dare you. 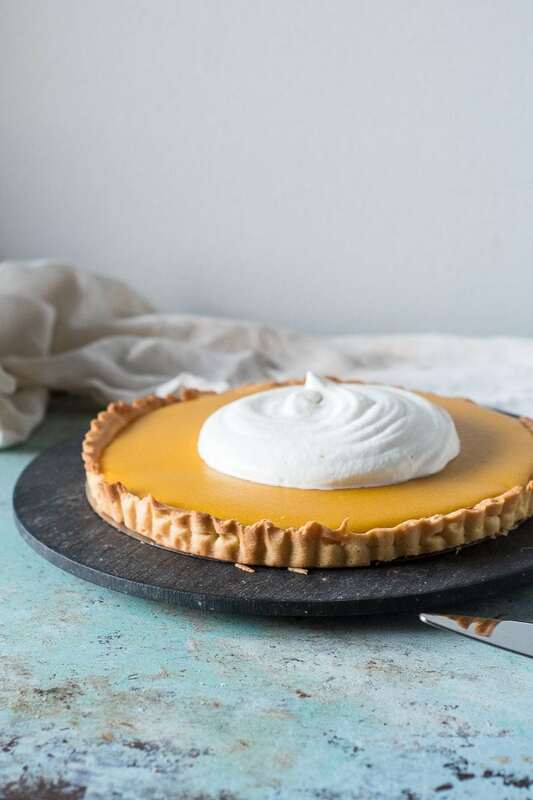 This passion fruit tart is one of my all-time favorite desserts. 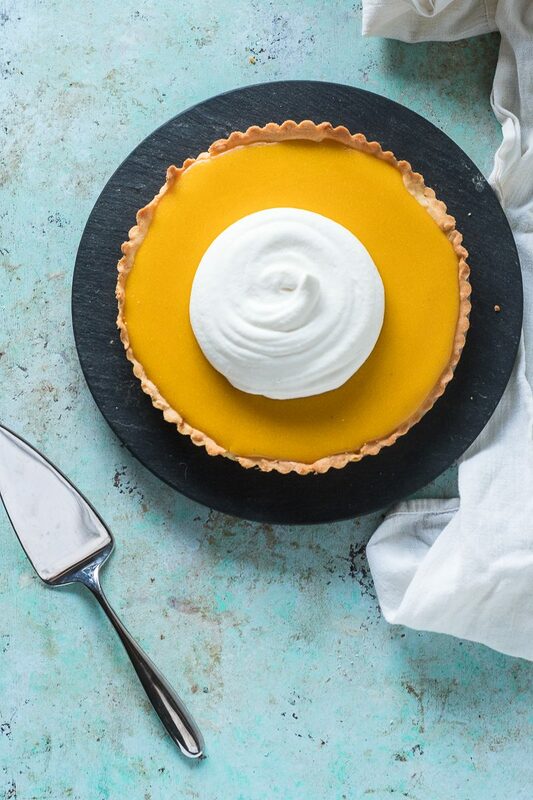 It's like a lemon tart (or lemon meringue pie) but better. 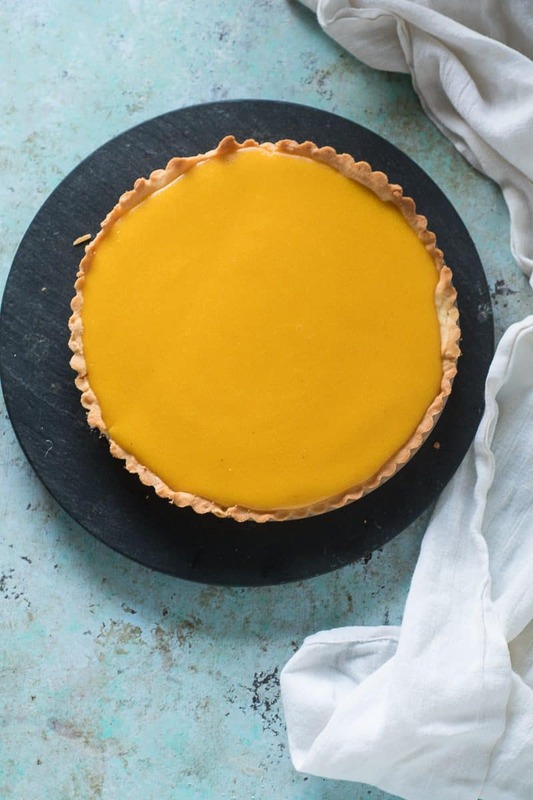 The tart crust has a lighter, airier texture than most because of the long creaming time. This makes it more delicate and rustic than some might prefer, but I love it. That said, if you have go-to tart crust or pâte sucrée, feel free to use it. I tend to use frozen passion fruit puree for this. It's often available at Mexican grocery stores and at some big chains. I usually use Goya brand, but I'd recommend sticking to a brand that lists passion fruit as the only ingredient. (You can also order it online.) If you have fresh passion fruit, though, you can absolutely use them. Just slice open the fruit, scoop out the pulp and remove the seeds and use it here. This tart doesn't need any adornment, really, but I like to top it with some lightly sweetened whipped cream. You'll need a 9.5-in tart pan and a half sheet pan for this recipe. Add the butter to the bowl of a stand mixer and beat on medium speed for one minute. Add the powdered sugar and cream on medium-high speed until the mixture turns pale and looks almost fluffy, about 7 minutes, occasionally stopping the mixer to scrape down the sides of the bowl. Add the egg yolk, vanilla extract, and salt and mix until incorporated, about 1 minute. Add the flour and mix on low speed until no dry flour remains, about 1 minute. Turn the dough out onto a large piece of plastic wrap, pat into a disk about 1-inch thick, and wrap well. Chill in the refrigerator for at least 2 hours or overnight. Take your dough out of the refrigerator and let it sit for 5-10 minutes. On a lightly floured surface, roll out the dough into a circle about an 1/8-inch thick and about 11-inches in diameter. Have a 9.5-inch tart pan ready and carefully press the dough into the pan and trim off the excess. Freeze for 30 minutes. Preheat oven to 350°F. 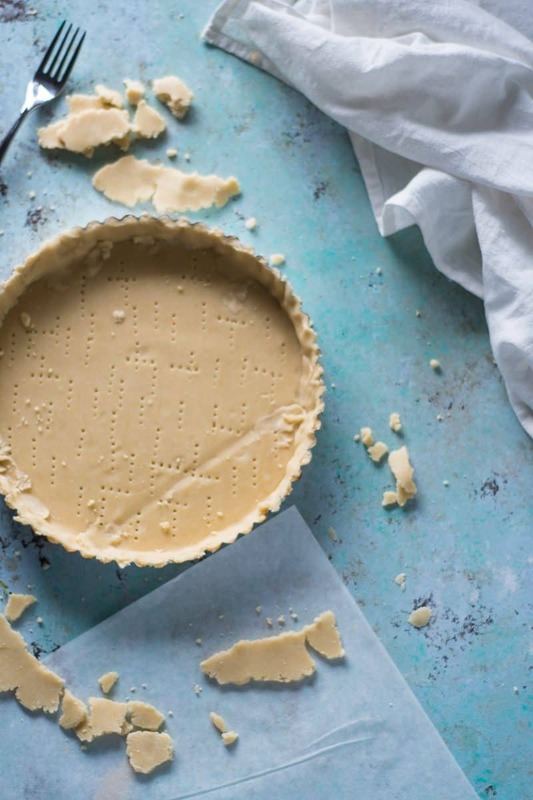 Place the tart pan on a rimmed baking sheet. Line the tart shell with parchment paper or aluminum foil and fill with pie weights or dried beans. Bake for 30 minutes. Remove from the oven, let cool for 5 minutes, remove the liner, and bake until golden brown, about 15 minutes. (Don't panic if the tart shell shrinks a little in the oven.) Let cool. In a medium, heavy-bottomed saucepan, add the egg yolks, whole egg, sugar, vanilla extra, and passion fruit puree and whisk together. 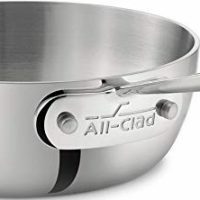 Gently heat over medium-low heat, whisking constantly, until the mixture has thickened, about 7-10 minutes. Immediately pass through a fine mesh strainer and stir in the butter. Preheat the oven to 325°F. 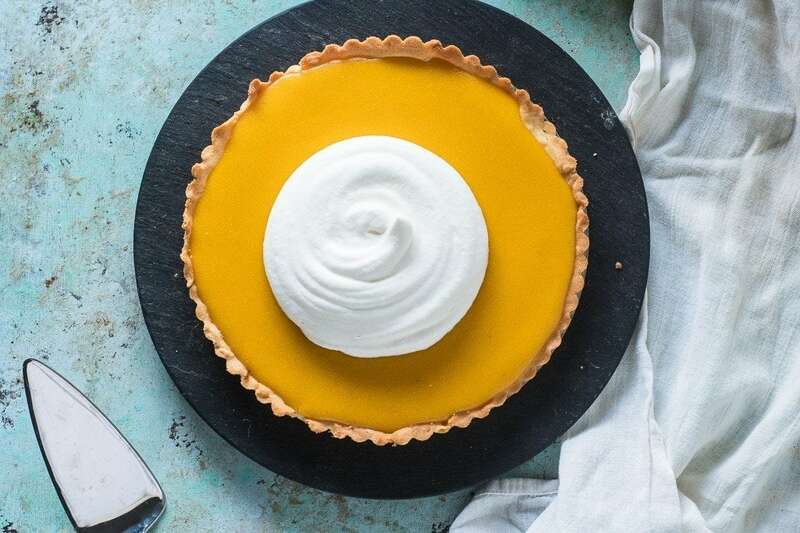 Place the prepared tart shell on a rimmed baking sheet, pour the passion fruit curd into the tart shell, and bake until the curd sets, about 12-15 minutes. To see if it's set, gently tap the edge of the tart pan to see if the center of the tart jiggles. If it doesn't jiggle, it's set. Let cool to room temperature. 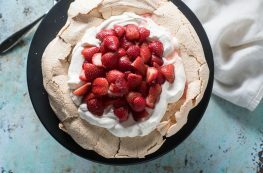 Serve with whipped cream, if desired. Will keep, stored in the refrigerator, for 3 days. This tart is absolutely gorgeous and fresh looking! 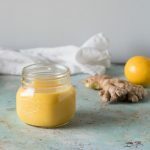 I’ve never used passionfruit puree however, sounds incredible! I can’t wait to try this recipe, thanks! This tart looks fabulous I have never had passion fruit you inspired me! 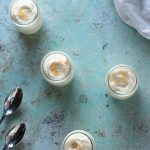 I am very much a fan of lemon so I am really excited to try this recipe! Thank you for sharing! What a delicious FRUIT TART!!! I simply cannot wait to try it! Very interesting combination of ingredients. I am saving this recipe for later.